The Union Gap School District recently received the 2016 Washington Achievement Award, which is sponsored by the Washington Office of Superintendent of Public Instruction and by the Washington State Board of Education. 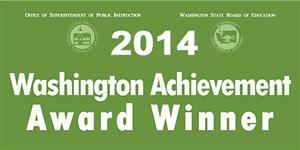 This is the 4th year in a row that the district has received this award. Award winners were selected on calculations based on student test scores collected statewide over three years. A total of 280 schools statewide received the 7th annual award out of approximately 2,200 schools in the State of Washington. The awards recognize the state’s top-performing schools in seven different categories: Overall Excellence (top 5 percent in the state, based on a 3-year composite rating), English Language Arts Growth (top 5 percent growth ratings during 3 years), Extended Graduation Rate (only awarded to high schools), English Language Acquisition (top 5% in the state, based on a state language proficiency assessment and other criteria), Math Growth (top 5 percent growth ratings during 3 years), Closing the Achievement Gap and High Progress (top 10 percent for achievement and improvement in both reading and math for three years). The Union Gap District was recognized for accomplishments with English Language Arts Growth. The Union Gap School District recently received the 2015 Washington Achievement Award which is sponsored by the Washington Office of Superintendent of Public Instruction and by the Washington State Board of Education. This is the 3rd year in a row that the district has received this award. Award winners were selected on calculations based on student test scores collected statewide over three years. A total of 258 schools statewide received the 7th annual award out of approximately 2,368 schools in the state of Washington. The awards recognize the state's top-performing schools in seven different categories: Overall Excellence (top 5% in the state, based on 3-year composite rating), English Language Arts Growth (top 5% growth ratings during 3 years), Extended Graduation Rate (only awarded to high schools), English Language Acquisition (top 5% in the state, based on a state language proficiency assessment and other criteria), Math Growth, Achievement Gap, and High Progress (top 10% for achievement and improvement in both reading and math for 3 years). The Union Gap School's award categories were: Overall Excellence, High Progress, English Language Arts Growth, Math Growth and English Language Acquisition. 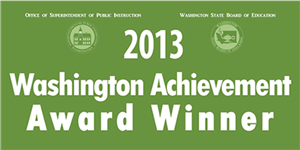 The Union Gap School District recently received the 2014 Washington Achievement Award which is sponsored by the Washington Office of Superintendent of Public Instruction and by the Washington State Board of Education. This is the 2nd year in a row that the district has received this award. Award winners were selected on calculations based on student test scores collected statewide over three years. A total of 401 school statewide received the 6th annual award out of approximately 2,368 schools in the state of Washington. The awards recognize the state's top-performing schools in six different categories: Overall Excellence (top 5% in the state, based on 3-year composite rating), Reading Growth (top 5% growth ratings during 3 years), Extended Graduation Rate (only awarded to high schools, English Language Acquisition (top 5% in the state, based on a state language proficiency assessment and other criteria), and High Progress (top 10% for achievement and improvement in both reading and math for 3 years). The Union Gap School's award categories were: Overall Excellence, High Progress, Reading Growth, and Math Growth.